That was Johnny Mowlem’s reaction, in the (fortunately) brief moments between his Autosport Designs Racing SPEED GT Aston Martin catching fire, and him getting the on-board extinguisher going, parking the car and baling out. The incident happened on Sunday at the St. Petersburg Grand Prix in Florida, on the formation lap for the WORLD SPEED GT event: suddenly, getting heat into the tyres, with some weaving and stabs on the brakes, was followed by “a sound like the wind – which was the flames coming past me. After that all I could see was orange. I hit the extinguisher, which immediately started calming the flames down and then I got the hell out!" Johnny Mowlem was due to line up on the seventh row for the race, but in fact he’d qualified quickest in his (slower) session. Meanwhile, tomorrow night on SKY in Europe, you can see the first of a TV series called ‘Johnny Mowlem Racing Travels’. The full listings are attached below. So there’s a Johnny Herbert item based around karting, plus Jonathan Cocker racing in the Asian Carrera Cup, then there’s a section based upon Johnny Mowlem’s experiences in the ACEMCO Saleen last year, plus his adventures at Daytona, followed by a power boating feature etc. etc. 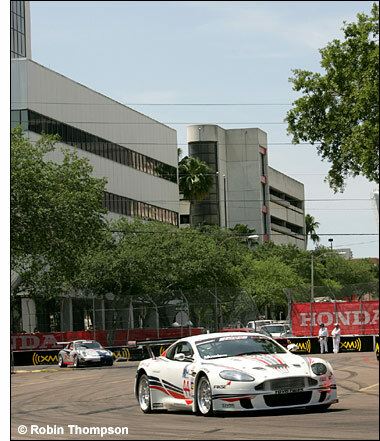 Next stop on the Mowlem 2006 schedule is Long Beach, for the next round of the SPEED GT series – in that beautiful Aston Martin. Robin Thompson captured the images at St. Petersburg, before the car caught fire. 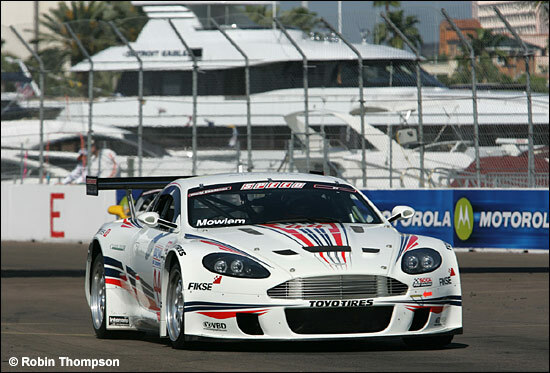 Johnny Mowlem Racing Travels Year 2006; April 19, 8:30 a.m. Sky Sports 3 Digital.